Nothing good ever happens in clock towers. Either you wind up getting poisoned by a mutated super soldier while you're trying to escape a city, or you're dealing with supernatural serial killers. But it's not all thrills and chills, and in Self-Defiant's point-and-click escape game Must Escape: The Clock Tower, all you have to do is find your way back out of one. Just click whenever your icon changes to interact, and use the arrows to look around or move to new locations. Must Escape: The Clock Tower is best described as short and sweet, though a bit of extra polish in some areas to take care of typos would have helped overall. Most will simply find it a brisk warmup than a really substantial challenge, with fairly obvious clues and most puzzles amounting to fixing things. It's like you're role-playing as a mechanic. At one point, you'll be transporting objects between scenes with your cursor, however, which is fairly neat, and with a satisfying chunk of puzzles that'll make you feel like a time lord if not a brainiac. Must Escape: The Clock Tower has few frills, but will kickstart your brain and prepare you the next time you wander into an abandoned building and somehow manage to get lost on five floors where the only way to go is straight up or down. No, I'm not judging you. Aloud. Must Escape: The Clock Tower Walkthrough now available! Your first view is of the back of the clock. Note that you can click on it but nothing happens. A gear is missing. Turn right. Now you see a wooden door, a trunk and a glimpse of a gear turning behind the wall. There's a cog at the top of the wall that you can't reach. Click on the trunk until it's under the cog.Now you can click the cog but realize it's bolted down. The door is locked and needs a silver key. But, you can peak through a knothole to see what's on the other side. Turn right to see some barrels and the stairs leading down. Note that you're on the 5th floor. Also take notice of the date on the barrels. Go down to the 4th floor. Now you see a little cupboard under the stairs. It's jammed and there isn't a keyhole. Go left. Here you see bars blocking your progress further west, more cogs in the wall, a bench and a red box. Something is missing on the wall near the other cog plus the lever is stuck. Enter the correct code and get a WRENCH. Return to the 5th floor and go left to the scene with the door and the bolted down cog. With the trunk in place under it, reach the COG on the top of the wall and use the WRENCH to undo the bolt. Take the COG off the wall. Go back downstairs and then left, back to the bars and lever. Attach the COG to the wall where it was missing. Pull the lever to open the bars. After opening the bars, continue left and go downstairs to the 3rd floor. The stairs down here also have a cupboard under them. Open the cupboard door and get a CROWBAR. Use the CROWBAR to open this cupboard door. Pick up a boot and examine it, clicking its bottom until you find the key hidden under the sole. Head back to the locked up wooden door on the 5th floor. In the middle of the workspace is a gear, but it's missing parts (you'll need 2 PIECE OF COGS to fix it). To the left of that is a piece of wood that might be useful, but it's stuck. Move aside the nuts and bolts until you find a PIECE OF COG (1/3). Take it. You need to find more pieces. You need a 3-color combination to open this box. When correct, click the grey rectangular button to open it. The white book needs a four color combination to be opened. When you get the book open, you can take the second PIECE OF COG (2/3). Go left from the bookshelves. Here is a table with some half-eaten meal left behind. Move the plate aside to get the last PIECE OF COG (3/3). To spare your legs, before running back upstairs, let's explore the lowest floor first...Go left. Make a passing note of the crates and how you can carry them. Then, continue downstairs and all the way to the right. Here's a door needing a gold key and a coat hanging by the door. Look inside the coat pocket to find a BLACK KEY. Also look at the bar up on the ceiling...There's a PIN but you need a way to reach it. Go back to the second floor landing. Grab one of the CRATEs that are stacked next to the stairwell. Return with it to the door area on the first floor. Finally, with the 3 stacked crates, you can reach the PIN and take it! The cobwebs are so bad, you can't reach the key. Remember to look for a means to get rid of them. Go back to the 3rd floor and the door by the stove. Use the BLACK KEY to go inside this door. It's a lovely bedroom. Searching around you find that the wardrobe needs a blue key. Okay! More to do still. Go all the way back up to the top floor and go inside the workroom. Place all 3 PIECES OF COG into the gear mold. Then, use the GLUE to hold it all together. 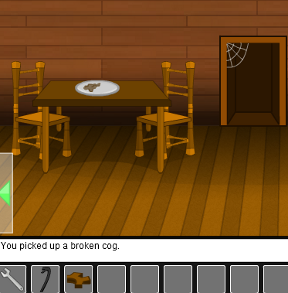 Remember the missing cog by the table? Return to the 2nd floor and go left. Place the repaired COG on the wall by the table. take the HAMMER and the SCREWDRIVER. Pick up the WOODEN ROD. Now take your wooden rod down to the stove on the 3rd floor. Open the stove, put the WOODEN ROD in the fire and you'll have a TORCH. Use the TORCH to burn away the cobwebs. Use the TORCH to light the candles on either side of the tapestry. With the candles lit, the tapestry lifts up to reveal a panel. Use your SCREWDRIVER on the four screws holding the panel in place. Behind the panel is a MEDIUM GEAR. Take it. Now you have a blue key and a medium gear. Time to do a few more tasks... Go first to the bedroom on the third floor. Use the BLUE KEY to open the wardrobe. Now take your two gears, and the pin you go earlier, up to the clock on the 5th floor, all the way back to where you started this escape. Set first the MEDIUM GEAR on the horizontal rod of the clock. Next, place the BIG GEAR over that. Finally, use the PIN to hold it all in place. With the clock repaired and the gears turning, a GOLD KEY drops down. Pick it up. The gold key is your key to escape. Go all the way back downstairs to the first floor's door. Use the GOLD KEY and you're out! Congratulations! You esaped the clock tower! moments, but it's a cute, original puzzle. Needed some of the hints this time round (excellent walkthrough by the way!) and there was a small bug whereby I had applied the glue but it still came up with the same pre-glue message. Good fun though! God... my feet are sore after going up and down all those stairs ! Nice little escape game. Much, much easier, much shorter, and far less moody than his other games I've played. Still fun though. don't open the black door if you value your cog! Really messed up. Glue bug doesn't allow this to finish. Tried in 2 diff. browsers. Hey! I wanted to do something with the empty frame that popped up when I clicked on the chest of drawers in the bedroom. Too bad there wasn't a way to teleport between the floors though. Right right down left left down ... gets old fast. Yeah, I got the same glue bug. I fixed the cog and the glue disappeared, but the lines that should indicate the fixed fissures turned back to their original broken state and it keeps asking me to use the glue that no longer exists. Which is annoying considering I can only finish it replaying it, and to do so I'd have to walk all over again. Almost got it by myself... I had problems with figuring out the green box combination, so couldn't get the glue.